Newport Historic District, which encompasses 250 acres and was designated a National Historic Landmark in 1968. If you visit Newport Rhode Island, you'll definitely want to put this spot on your to do list. Here you'll see well-maintained architecture on display in this former Colonial capital. 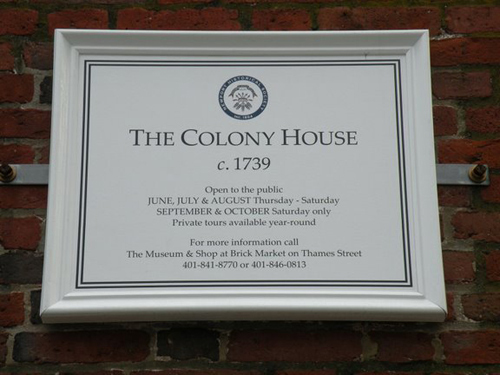 Completed in 1741, this was the home of the Colonial, and later, the State Legislature of Rhode Island. The Declaration of Independence was read from these steps on July 20, 1776 by Major John Handy. Later, during their occupation of Newport, the British used this structure as a barracks for their troops. Presidents George Washington and Dwight Eisenhower both visited here, inspiring the names of the Square and its park (Eisenhower Park). Before being named after Washington, this area was called The Parade. There is a painting of Washington, done by Gilbert Stuart, on the second floor. It is seen in the picture below, from my grandfather's collection. If you've seen Steven Spielberg's film, Amistad, this area may look familiar to you. Many Newport RI attractions can be seen in the film. 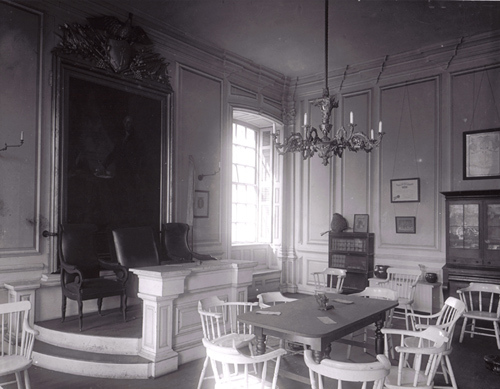 The Colony House was used for both exterior and interior shots during the court room scenes. You can arrange private tours and even rent the house for events year-round. The property is still owned by the State, but is run by the Newport Historical Society. Call 401-846-0813 for further information. This is Newport's Courthouse. It is one of the Newport RI attractions where you don't want to be a guest. 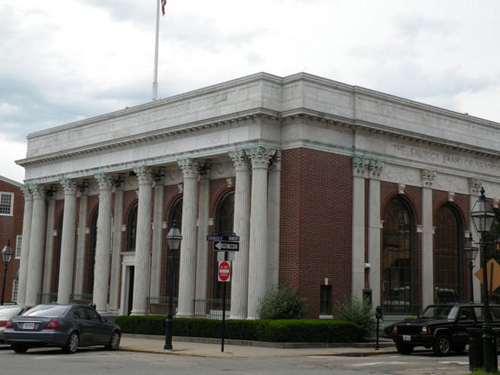 It houses Newport's Family, District and Superior courts. Behave during your visit, and you won't end up here! 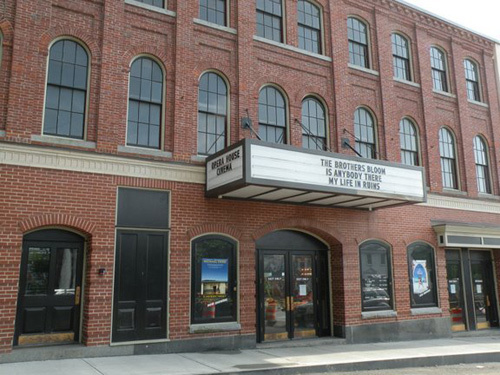 One of Aquidneck Island's 3 movie theaters. The Opera House, which originally opened in 1867, shows feature films, and also hosts the Newport International Film Festival. 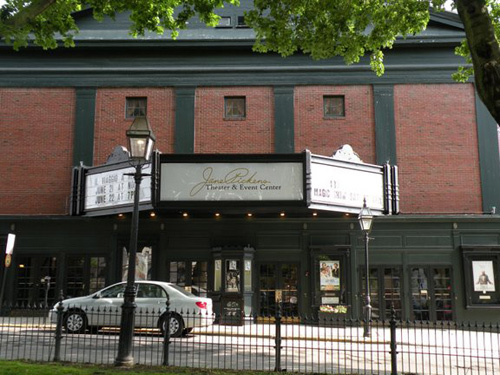 Just one block west of the Opera House, Jane Pickens also hosts the Newport International Film Festival every summer. This historic theater was built in 1834, and was home to the Zion Episcopal Church. Today, it hosts live events and shows a variety of films on its screens, including opera performances and independent films. Situated in the middle of Washington Square, this park has seen much history over the years. 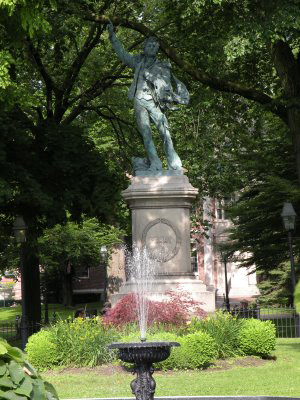 The statue in the center of the park is of Commodore Oliver Hazard Perry, known as the "Hero of the Battle of Lake Erie" from the War of 1812. The statue is right across the street from Perry's former home, the Buliod-Perry House, which was built in 1750. Yesterday's opened in 1974. 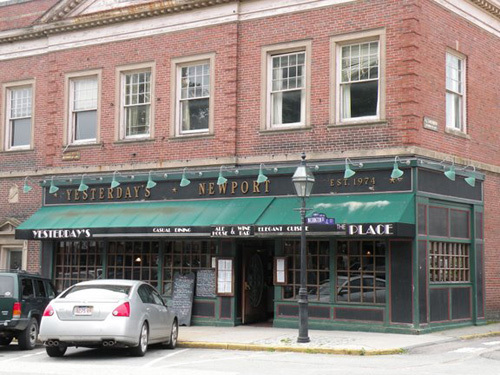 It used to be a popular nightclub, but is now one of my favorite Newport Rhode Island restaurants. This location is one of the most popular spots for locals year-round, and was probably the busiest spot in town back in 1997, when Steven Spielberg's film Amistad was shot in Washington Square. In addition to its extensive beer and wine menus, the food is fantastic. They even have an Asian and Thai menu. I can't wait to go back again to try their Thai Chicken Peanut Pizza! This structure, built in 1911, is listed in the U.S. National Register of Historic Places. It was built by a local philanthropist to serve the large Naval presence in Newport. When the U.S. Navy pulled out of Newport in 1973, the YMCA closed. 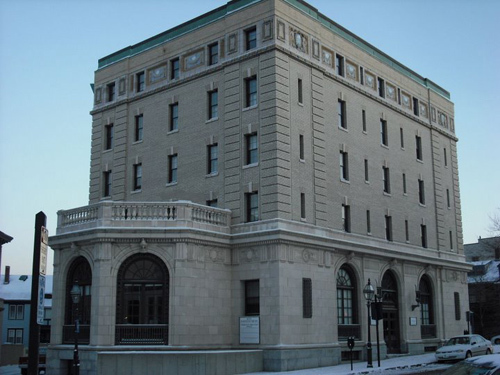 This building now hosts low-income housing. 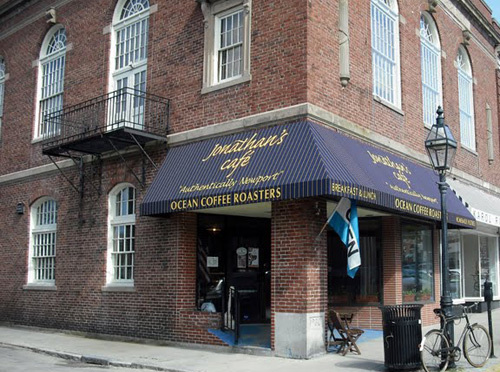 As I mentioned on my Newport Coffee Shops page, this is one of the best spots in Newport to get some coffee and breakfast. 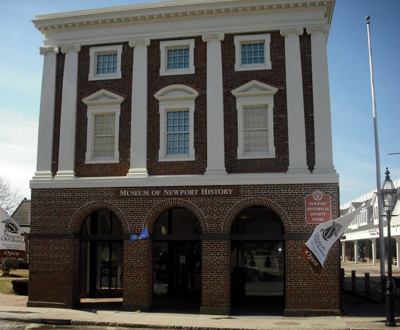 Located at the bottom of the hill, at the west end of Washington Square, is the Museum of Newport History. This is one of the best Newport RI attractions because of the great education it gives on Newport's history and architecture. 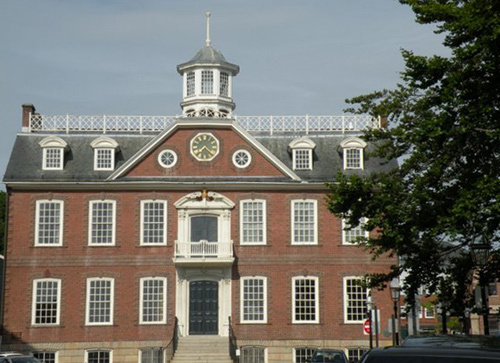 The museum is located in the old Brick Market building, which was designed in 1762 by famed architect Peter Harrison. 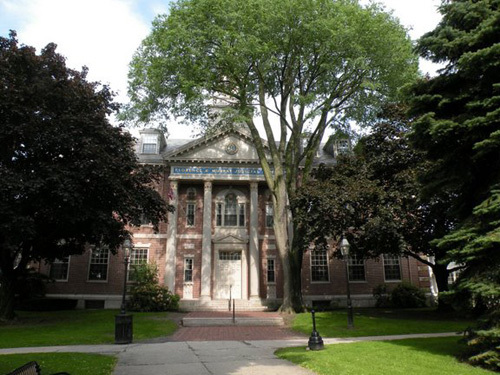 Harrison also designed Newport's Redwood Library and Touro Synagogue between 1747 and 1772. The museum is open daily, and features many great exhibits, including James Franklin's (yes, Benjamin's brother) printing press. 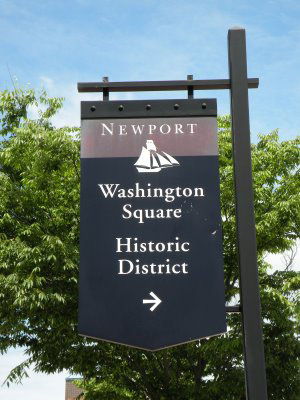 Washington Square is one of many historic districts full of Newport RI attractions. To see more of these fascinating places, click on the link below.